Both Melon (Cucumis melo L.) and Watermelon (Citrullus lanatus) are annual plants of the Cucurbitaceae family and with a creeping and climbing nature. Melon, originated in Africa and southwest Asia, has a sweet edible, fleshy fruit variable in shape, size and color depending on variety. Surface can be smooth, warty and white-yellowish, green or speckled. 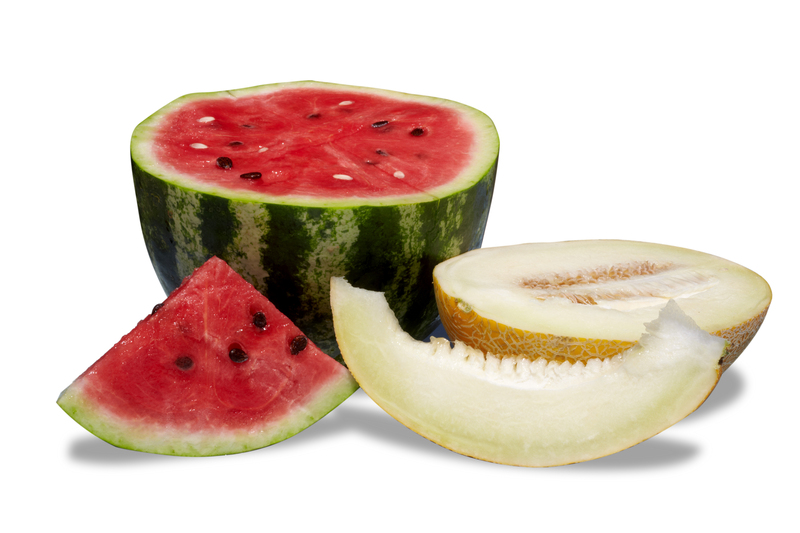 Watermelon is native to southern Africa. Its fruit has a smooth hard rind, usually green with dark green stripes or yellow spots, and a sweet, juicy interior flesh (usually deep red to pink, but sometimes orange, yellow, or white) with many seeds, which can be soft and white or hard and black. Climate: Melon plant requires warm and not excessively humid climate, so that in humid regions with low insolation its development is adversely affected, showing alterations in ripening and fruit quality. Watermelon is less demanding in temperature than melon. Humidity: Melon: At the beginning of plant development the relative humidity should be 65-75%, flowering 60-70% and fruit development 55-65%. Watermelon: The optimum relative humidity for watermelon is between 60% and 80%, being a determining factor during flowering. Soil: Watermelon needs light soils, rich in organic matter and well drained. Deep and loam soils, as well as sandy clay soils are good for watermelon growth too. Melon is less demanding than watermelon. It needs soft, fertile, deep, well ventilated and drained soils. Potassium, Calcium, Zinc and Boron are also applied via foliar. 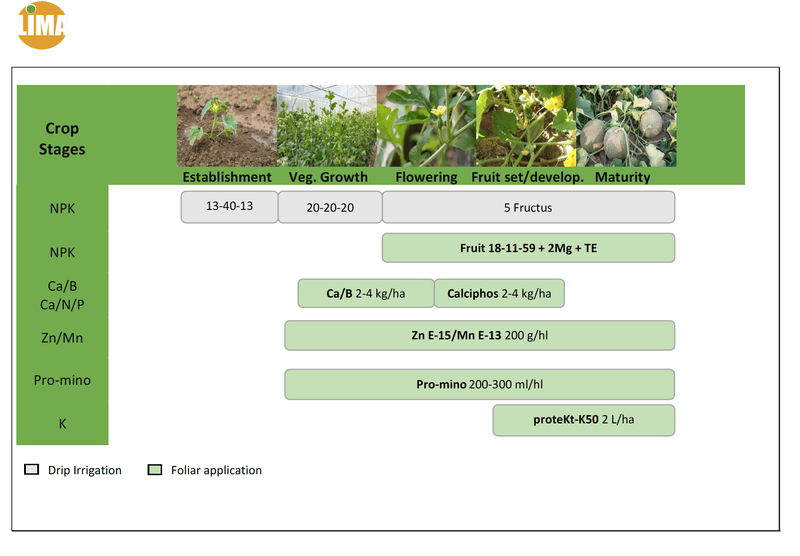 Lima Europe has a wide range of foliar fertilizers and special products for foliar application. Calciphos: 2-4 kg/ha. In corder to eliminate deficiencies. 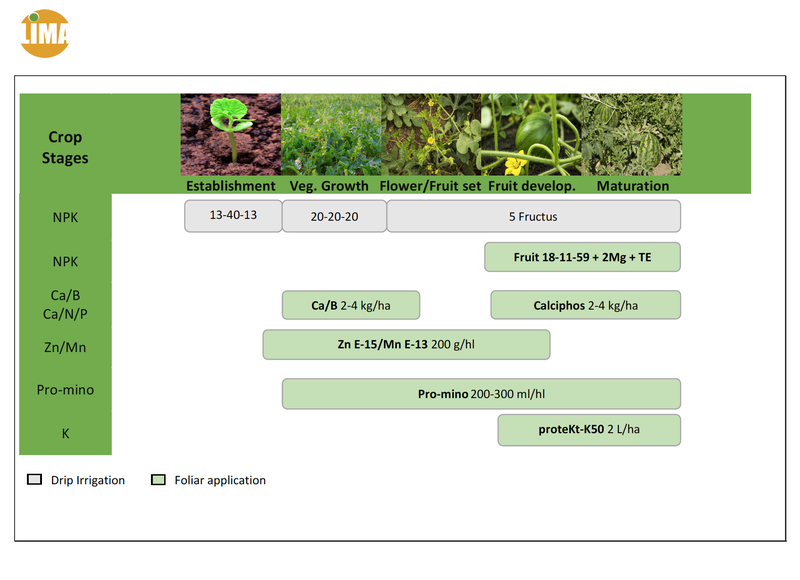 Calciphos stimulates flowering, fruit set, fruit growth, etc.